There were 689 press releases posted in the last 24 hours and 153,520 in the last 365 days. 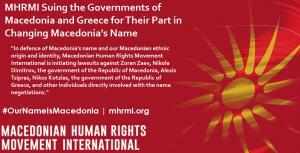 MHRMI filing lawsuits in defence of Macedonia's name and our Macedonian ethnic origin and identity. MHRMI is demanding an immediate, court-ordered end to the illegal, anti-Macedonian name negotiations and is suing for damages from all of the named parties. TORONTO, CANADA, February 8, 2018 /EINPresswire.com/ -- In defence of Macedonia's name and our Macedonian ethnic origin and identity, Macedonian Human Rights Movement International is initiating lawsuits against Zoran Zaev, Nikola Dimitrov, the government of the Republic of Macedonia, Alexis Tsipras, Nikos Kotzias, the government of the Republic of Greece, and other individuals directly involved with the name negotiations. MHRMI is demanding an immediate, court-ordered end to the illegal and unconstitutional name negotiations and is suing for damages from all of the named parties on behalf of Macedonians worldwide for the blatant contravention of all United Nations and international human rights conventions. The illegal imposition of new membership conditions placed on Macedonia by the United Nations violates Article 4 of the UN Charter and violates Articles 2 and 15 of the Universal Declaration of Human Rights. The negotiation and proposed changing of Macedonia's name, identity, language, history and ethnic origin, have set back human rights successes by Macedonians decades and fly in the face of all basic human rights standards that the named defendants are obligated to uphold. The negative emotional impact that Macedonians are suffering having to watch their ethnic identity being negotiated away by the named parties — who are obliged to uphold basic human rights standards — is immeasurable. Watching the frightening, racially-charged protests in Greece, demanding the eradication of Macedonia and our Macedonian ethnicity, has scared many Macedonians into being afraid to publicly declare their Macedonian identity. Further, the fact that the named parties are actively participating in the removal of an entire ethnic group's identity is causing severe emotional distress and invokes memories of the severe human rights abuses — based solely on their Macedonian ethnic origin — that these individuals have already endured. Therefore, MHRMI has no alternative but to use the courts of law to sue for damages and to seek the immediate end of the UN-sponsored anti-Macedonian name negotiations.